A clean, beautiful home invites family and friends to come together. But when your cleaning leaves a strong, chemical scent, others might not want to gather. Create a welcoming home that’s safe for everyone with the fresh and inviting scent of Thieves® Household Cleaner. 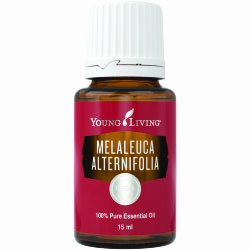 Formulated with the power of Young Living’s Thieves oil blend, you can get a deep clean without dangerous or synthetic ingredients. 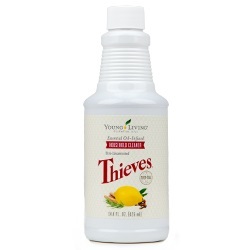 Thieves cleaner also includes the scent of Lemon essential oil for an even more uplifting aroma. Chores will feel like less of a chore with the sweet-and-spicy scent and effective cleaning power of Thieves Household Cleaner. This all-purpose cleaner can be used on any surface in your home for dusting, spot cleaning, scrubbing, or any other cleaning need. Wherever you use it, you’ll feel good knowing it’s safe to use around everyone in your family, including pets. Spot test in an inconspicuous area before applying this product to woods, plastics, fabrics, and granite. If staining or damage occurs, discontinue use on the material. 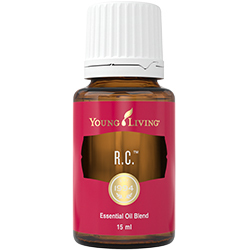 Suggested Ratios According to Usage •	All-purpose cleaner: Combine 1 capful Thieves Household Cleaner and 2–3 cups water. •	Degreaser: Combine 1 capful Thieves Household Cleaner and 2 cups water. For heavy cleaning, use half or quarter the amount of water. If necessary, use a cloth to apply Thieves Household Cleaner undiluted. After cleaning, wipe the area with a cloth dampened with water. 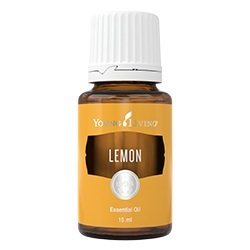 •	Glass and mirror cleaner: Combine 1 capful Thieves Household Cleaner, 5 drops Citrus Fresh™ essential oil blend, 1 teaspoon white vinegar, and 3 cups water. 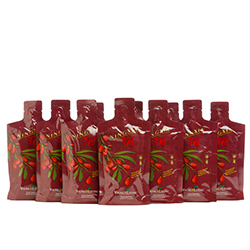 •	Suggested dilution ratios are included on the label. Before cleaning upholstery, fabric or carpet, perform a spot test with the Thieves® Household Cleaner in an inconspicuous area. Shake bottle before using for maximum benefit. •	Not recommended for internal consumption. Keep out of reach of children. Store away from excessive heat and direct sunlight.